Leicestershire based manufacturers of wedding venue backdrops, Mirage, are seeing an increase in winter wedding bookings and couples who are trying to cope with the economic slump seeking their advice. 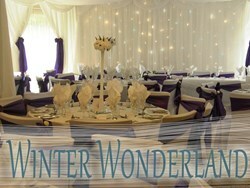 Mirage are seeing an increase in winter wedding bookings with savvy couples trying to save on their costs. Thousands more couples are choosing to tie the knot between October and March in recent years as a result of the economic downturn. Marrying in the off peak season means that couples can save thousands of pounds on their reception, with venues and caterers offering cheaper rates during the winter months. However, Mirage knows savvy couples still insist upon the highest of standards when it comes to their wedding venue, and they have enjoyed an increase in demand for their stylish backdrops created to transform any venue. According to The Telegraph (2012), the number of couples getting married in winter has risen by up to 15 per cent in some areas, with winter weddings now accounting for more than 30 per cent of all marriages in Britain. Getting married in the winter months can shave down a couple's budget by a quarter, which is a saving of thousands of pounds.The unpredictable nature of British weather is said to be a contributing factor in couples choosing the colder months, as opting for a covered winter ceremony means that people’s expectations of the weather need not be raised, meaning one less thing to get stressed about when planning the big day. Mirage offer a fantastic range of products which would be ideal for a Winter Wedding, as experts in the field they know a great deal about venue design and colour schemes. Mirage’s Starlight Wedding Backdrop in white or light blue with sparkling white lights would transform any venue into a mystical Winter Wonderland. Their Light Canopy in black adds to the effect; this superb ceiling-hanging drape creates the atmosphere of a beautifully clear winter’s night, complete with twinkling stars. To maximise the Winter Wonderland ambience, include the Mirage Starlight Walkway, which makes a glamorous and inviting entrance to the reception venue. To create a true snowy wonderland, stick to white, silver and black colours. Have gorgeous bouquets of white flowers and winter foliage, and incorporate snowflakes into centrepiece design. For Christmas marriages, consider adding a splash of colour with warm Christmas red. Red sashes look beautiful on the back of white covered chairs and add more of a festive theme to the wedding. Serving Mulled wine and mince pies after the ceremony is a lovely treat which helps warm up the guests a little. Followed by a delicious Christmas dinner with all the trimmings to complete the festive feast. Christmas trees covered with white twinkling lights are a fabulous addition to any Christmas or winter wedding; if the venue allows it real trees would be perfect, bringing the smell of Christmas indoors. Mirage Wedding Backdrops offer a range of products which are ideal additions to any wedding, event, party and exhibition to liven up the existing venue. The wedding backdrops are available to both hire and buy in a variety of different sizes including 6m, 7m and 9m lengths x 3m high. As an established UK manufacturer Mirage offer advice and assistance to their customers. Their starlight wedding backdrops open up new opportunities for their customers as they are a quick and easy to increase profitability of a venue by improving the ambience. Mirage Wedding Backdrops is a member of the HighSpec Group, offering a range of wedding backdrops, marquee linings, sports hall lining solutions and more. For specialist equipment geared towards room reduction, screening, and staging, visitors are encouraged to visit http://www.pipe-drape.co.uk/. For more information about hiring or buying a wedding backdrop, please contact the friendly team at Mirage on 01455 842 000 or complete the quick quote form at http://www.mirageweddingbackdrops.co.uk/.